Poultry Profits was the chapter devoted to demystifying chicken feed. Joel Salatin raises enough chickens that he can order his feed custom blended, and he’s done a lot of experimentation to determine the recipes that work best for him. He believes in keeping the mixture as simple as possible and using real ingredients. meal is to provide animal protein. Salatin performed side by side comparisons of various brands of “snake oil” (his term), and discovered that his chickens grew faster and stayed healthier when he added Fertrell Nutri-Balancer to the mix. He prefers to avoid chemically formulated vitamins and minerals since they break down readily in hot weather and are harder for the chickens to assimilate than are vitamins and minerals from natural sources, so he was glad to find a natural source. Now I know where the Fertrell Nutri-Balancer craze started! feed, but I will soon. Where do you get roasted soybeans and food grade limestone? Becky — You can find all of the ingredients that go in the average chicken feed at your local feed store. bl — This is the recipe Salatin reports in his book, so I assume it’s right at least as of 1999 when the most recent edition was published. You definitely need some source of protein in chicken feed, so grains alone usually don’t cut it. The vitamins and minerals could possibly be left off if the chickens have access to lots of pasture, but it’s safer to include them. 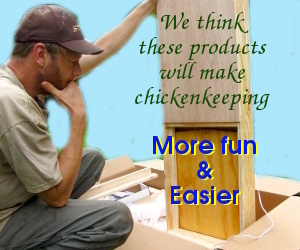 I built a chicken tractor last season and grew 50 broilers. since my brother pig farms and has a feed grinder/mixer i figured I would save the $ and mix my own. After much research I found no broiler mix I could go off of, so I made my feed of corn, barley, soymeal, the usual. I did take care in figuring the protein(thats all that matters anyway, right?). Long story short, my birds ended up half the size of a friend’s who used southern states broiler mix. I have since learned the value of minerals, nutri-balancer and all the extra! I am so glad to find this mix (Salatin fan! )but am wondering what the total protein of this mix is… so I can add the proper protein for them at their chick stage. Or does he use this mix for their whole lives? I will read this book next! Just finish salad bar beef. Thanks! Caleb — Excellent data point about your experience with making your own feed! It does seem dicey for the little guy, especially if you’re not able to give your birds lots of forage to round out their diet. If my memory serves me, I believe Salatin uses his recipe for the whole life of broilers (starter and grower/finisher). I don’t recall seeing the percent protein, but you could probably figure it out if you knew the protein content of the corn, etc. Ok, so I figured out the total protein would be about 20.005%, if my math is right. It soulds about right, but I’ll probably add a little for when they are chicks. Is this Joel Salatins current broiler mix recipe? I have his Pastured Poultry Profits book and he said that he also added Brewers Yeast. That book was written 20 yrs ago though, so perhaps he stopped using it. Sabrina —Good question. I got this straight out of his book as well, but can’t remember which edition of the book it was. Definitely not the first since there were, I think, two updated sections at the back. look in the back of the book for updates that he’s included regarding his feed rations. I thought we were supposed to eliminate soy because of its hormone changing properties.